People often get most excited about rosé wines during the hottest months, but they are super food friendly and especially good with fall ingredients. This fiber-rich vegetarian chili makes good use of produce that will be in Northeastern farmers’ markets well into October—tomatoes, chiles and cilantro—and it is incredibly warming. For a spicier chili, add the seeds of the jalapeño. 1. In a medium saucepan, cover the cranberry beans with 1 inch of water. Add the halved garlic clove and the thyme and bring to a boil. Simmer over low heat until the beans are tender, about 25 minutes. Drain, discarding the garlic and thyme and reserving 1 cup of the cooking liquid. 2. Meanwhile, using a box grater, coarsely grate the cut sides of the tomatoes into a bowl so you have a tomato puree; discard the skins. 3. In a deep skillet, heat the olive oil. Add the onion and cook over moderately high heat until it starts to brown, about 5 minutes. Add the minced garlic and jalapeño and cook over moderate heat until fragrant, about 1 minute. Add the cumin and cook for 30 seconds longer. Add the fresh tomato puree and bring to a simmer. Cook until the puree is slightly thickened, about 3 minutes. Stir in the beans and half of the reserved cooking liquid and cook until the beans are heated through, about 2 minutes. For a looser chili, add more of the cooking liquid; for a thicker chili, simmer a few minutes longer. 4. 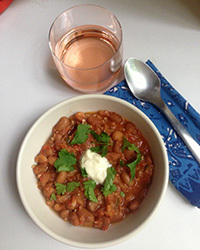 Transfer the chili to bowls, garnish with the crème fraîche and cilantro leaves and serve. Wine A fruity rosé, such as 2012 Oupia Minervois Rosé. One serving 416 cal, 20 gm fat, 5 gm sat fat, 56 gm carb, 22 gm fiber, 19 gm protein.